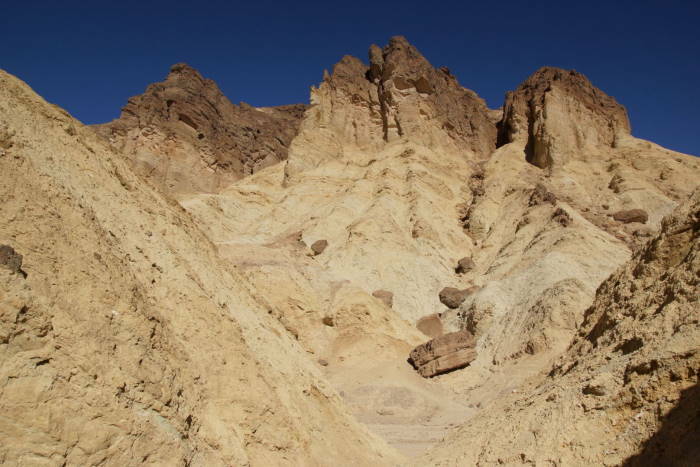 One of the best hikes in Death Valley allows you to get up-close to several of the park’s best features, including a colorful eroded canyon, and the easily recognizable mountain known as Manly Beacon. 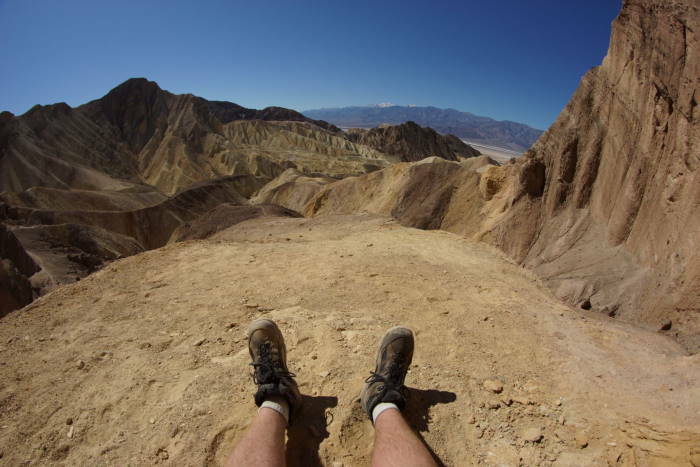 The Golden Canyon/Gower Gulch Loop is also a flexible hike, giving you the ability to hike a little or a lot, for a short while or for several hours. 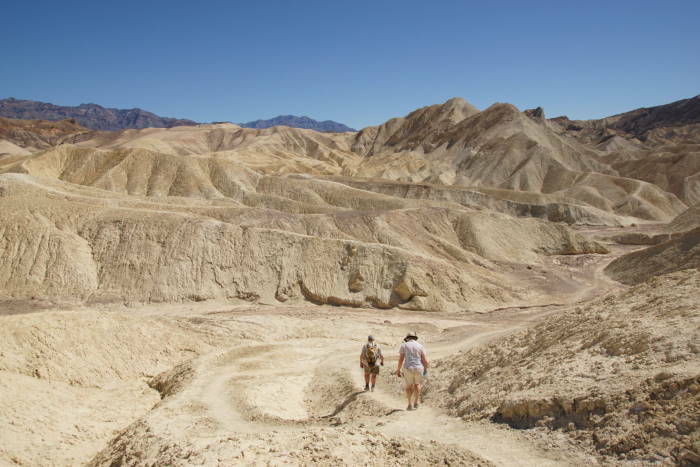 You can start your hike in two places — either at Zabriskie Point on Highway 190, or at the Golden Canyon trailhead on Badwater Road, just south of the Highway 190 junction at Furnace Creek. 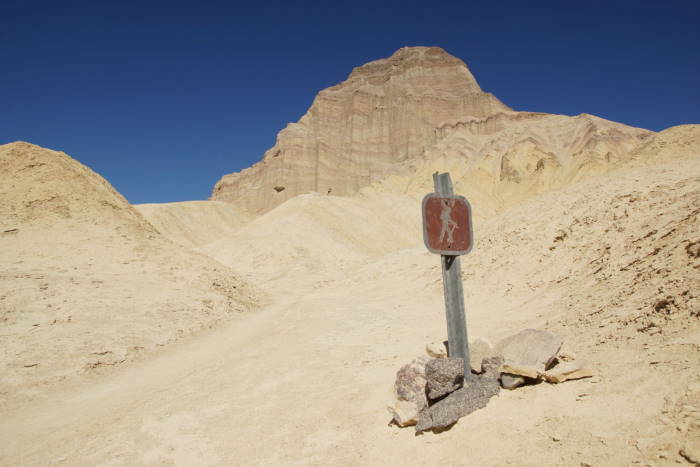 The Golden Canyon trailhead provides more direct access, and the description below begins and ends there. 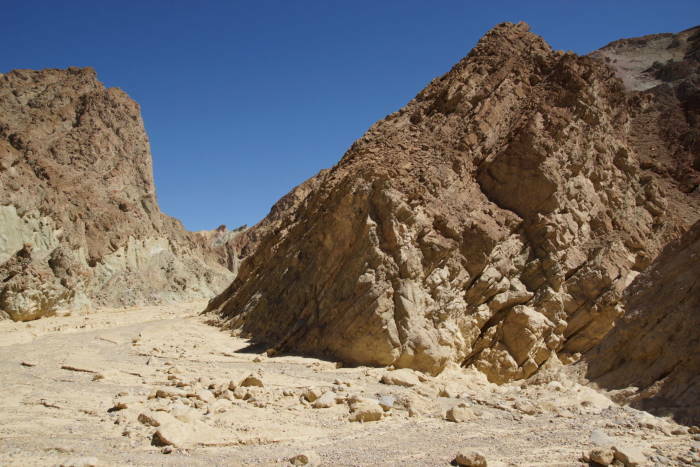 I was in the mood for a nice long hike, the kind that would take up an entire afternoon, when I set out on the Golden Canyon/Gower Gulch Loop. My entire hike covered about five miles. If you’re looking for something shorter, I’ll break down your options as we go. 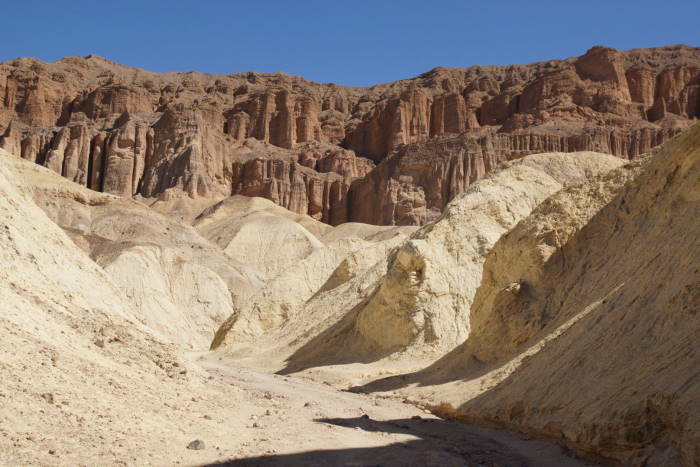 The hike begins with Golden Canyon, and as the name suggests, the landscape here consists mostly of yellowish dirt. 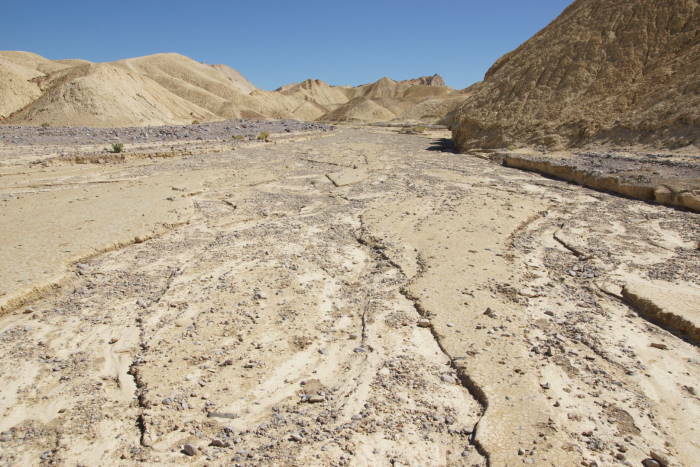 The trail takes you up the floor of the canyon — an area that could flood during storms, and you’ll see evidence of previous gully washers in the canyon floor. 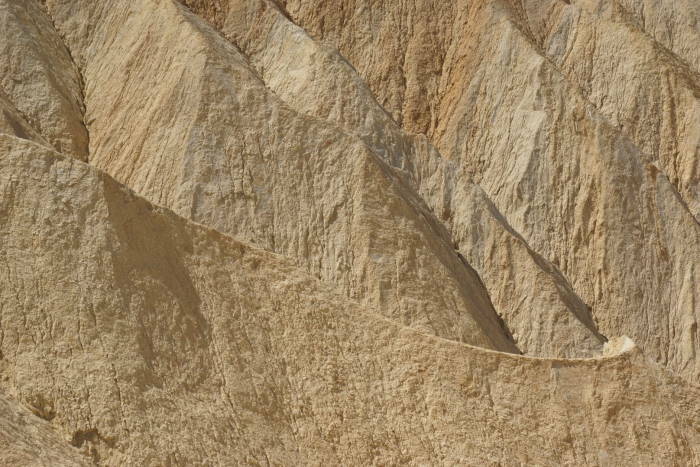 … like these sculpted cliffs. Some side canyons are very steep, so choose them wisely, and remember, there are easier ones, too. About halfway up Golden Canyon, you get your first peek at the stately hill known as Manly Beacon. 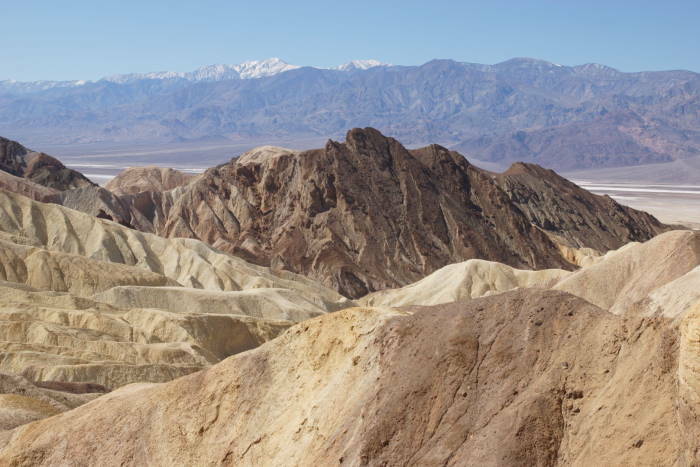 It’s name doesn’t refer to its masculinity, instead it honors William Manly, an early Death Valley explorer who arrived during the gold rush. At this point, I had no idea that I’d soon get much closer to Manly Beacon. 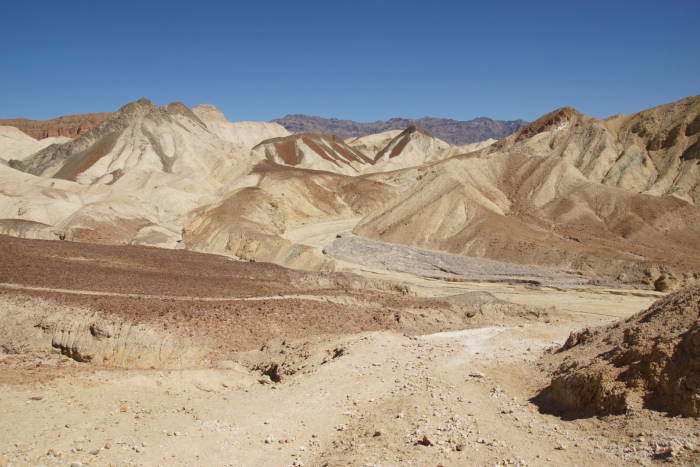 It truly is the star of this trail — but it’s not the only attraction. 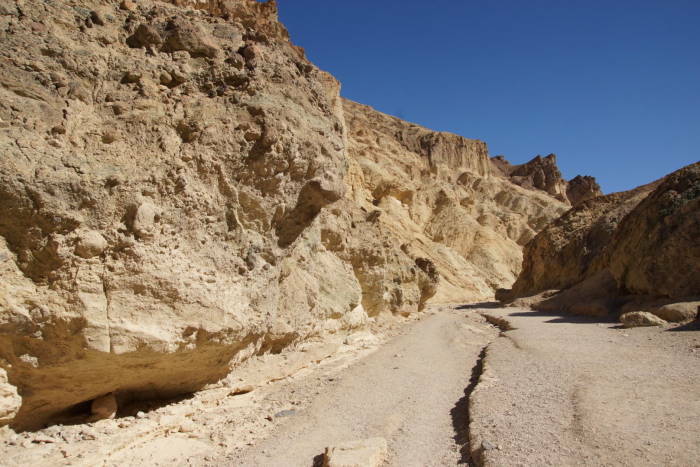 About a mile up the Golden Canyon trail, you reach a junction. The longer loop towards Gower Gulch splits off to the right, while a narrower trail continues forward to Red Cathedral. 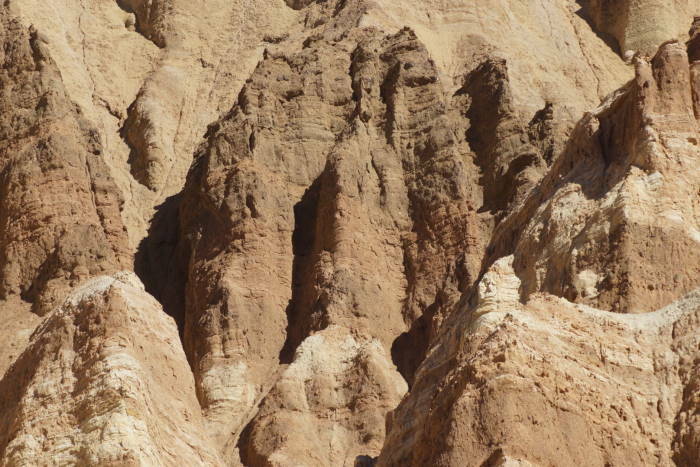 You can see part of it up ahead — sculpted red cliffs wrapping around the end of the Golden Canyon Trail. … but don’t be afraid to push a bit further. If you keep going up, you’ll reach an excellent viewpoint, which allows you to view the entire area. Kick back and relax. 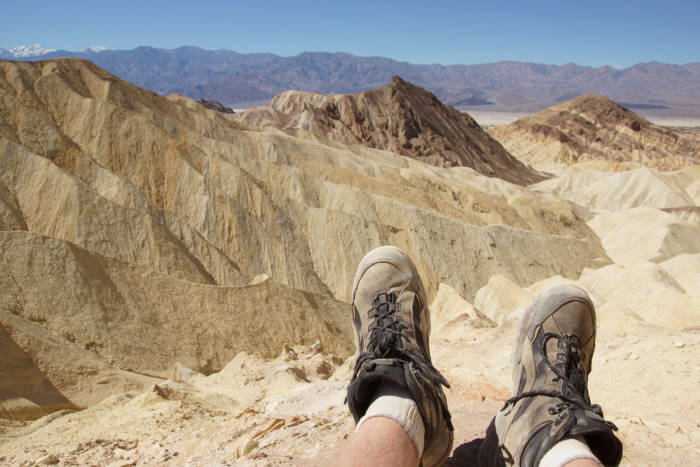 If you’re only interested in a short, fairly easy hike, this makes a good turnaround point. It’s another mile and a quarter back to your car, backtracking on the same path. But as I mentioned, I had committed the rest of my day to this trail, so I backtracked to that junction and turned towards the Gower Gulch Loop. This next section of the trail is truly remarkable, and it includes a treat I wasn’t expecting. After the junction, you’re headed straight towards Manly Beacon. The peak stands right in front of you, as you hike up onto its foothill, then curve around its base. 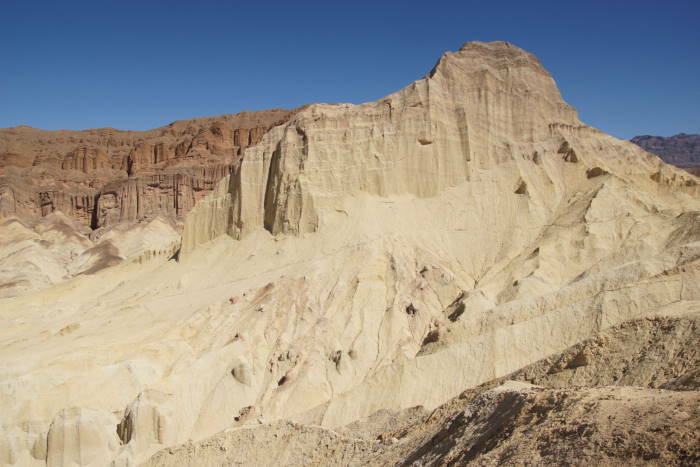 This entire area is covered with beautifully sculpted badlands. Look around for some surprisingly delicate curves in the otherwise foreboding dirt. 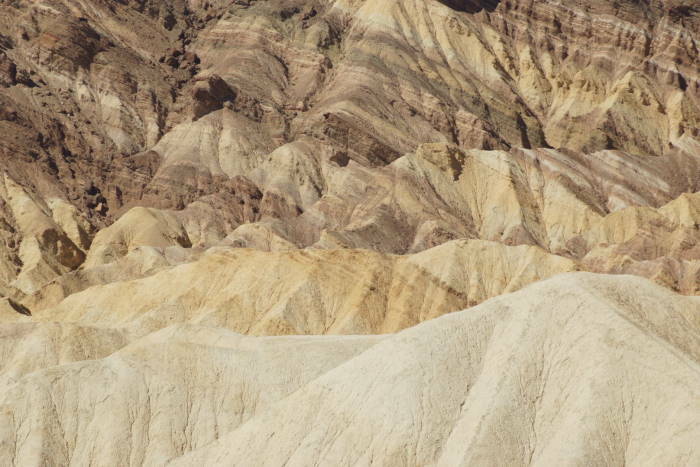 You’ll find some gorgeous stripes of color running through the hills. Directly below Manly Beacon, I found a spot to rest for a moment. While the climb is not extremely challenging, this part is pretty steep! If you just wanted to hike to Manly Beacon, then turn around at this spot and backtrack, it would be about a 3-mile round-trip. When you reach the high point on this part of the trail, you’ll notice a side-trail that leads out onto a ridge. Hike out to the end of this spur, and you’ll have an even better view of Manly Beacon (and Red Cathedral, next to it). After the climb past Manly Beacon, the trail changes. 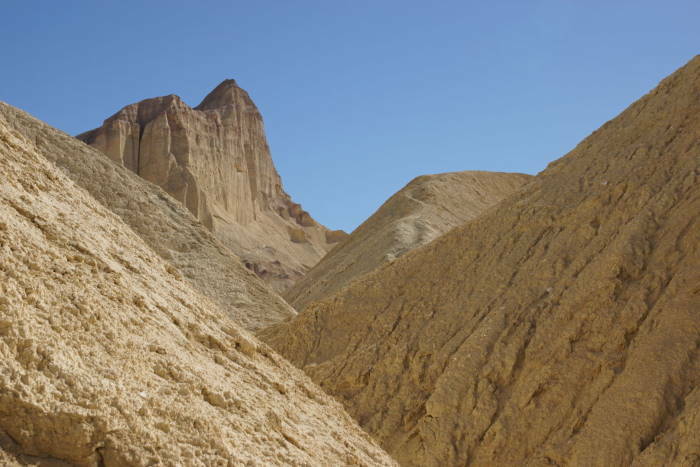 It heads downhill, onto the floor of the badlands. The trail climbs and dips a few more times, but it’s not as extreme as the climb you just finished. … I was headed the other way. It’s still quite a nice path. 8/10 of a mile past the previous junction (back in Golden Canyon) you reach the next crossroads. 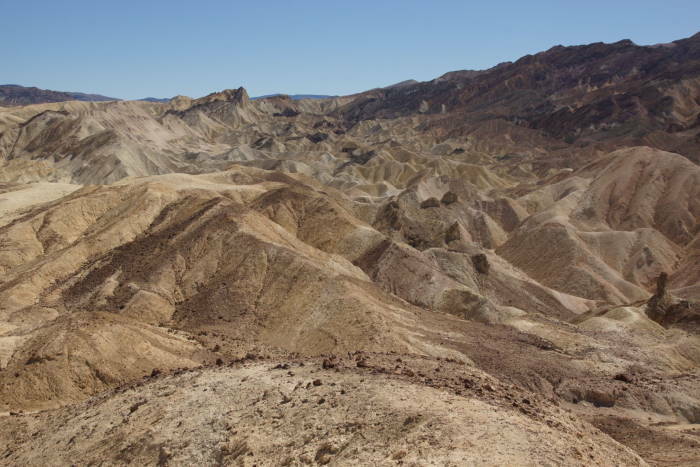 Here, the path meets up with the Badlands Loop. 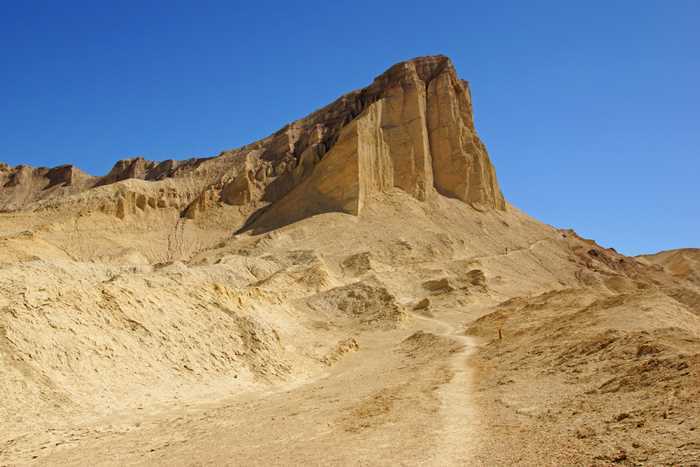 This 1.3 mile loop trail provides exactly what the name suggests — another half-hour of badlands exploration. Originally, I had planned to include the loop in my hike, but I was quickly getting hot and tired (and this was in the pleasant 80-degree weather of early March — imagine it in the summer!). So, I saved the Badlands Loop for another day, and instead turned towards Gower Gulch. 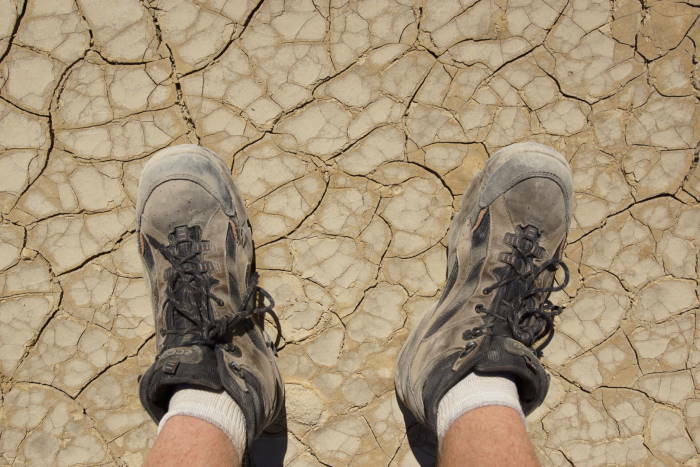 … with a dry, cracked bed. Thankfully, by this point, all the uphill hiking was behind me, and the path was pretty clear: just keep hiking down the canyon. This part of the hike seemed to go on and on forever. The official map says it’s only 1.2 miles from the Badlands Loop to the mouth of the canyon, but it seemed like much further. I only saw one detour along the way — a trail that led up a hillside to this old mine entrance. 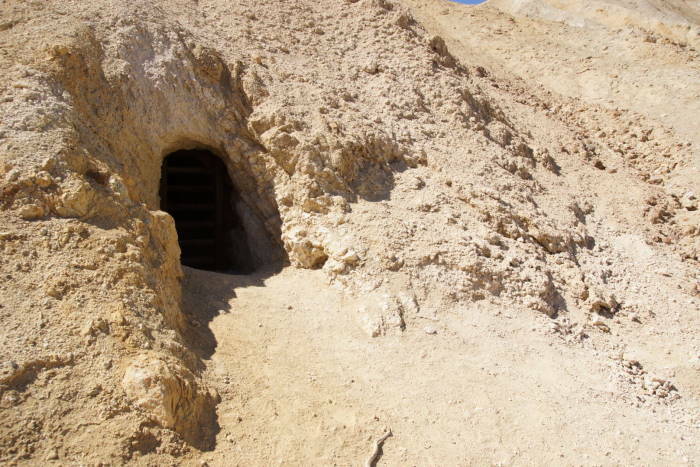 Looking inside, it looked like the tunnel split into two directions. Turning around, there was a pretty decent view of Gower Gulch. Near the old mine, a trail continued up the hill. I don’t know where it went, but I’m sure there was a good viewpoint at the top. I was too tired to tackle another climb, so I headed back down and rejoined the main trail. Gower Gulch remained wide for quite some time, then suddenly narrowed and circled around this hairpin curve. I can’t imagine the force of flash flood waters racing around this corner. After the turn, there’s a portion of the trail that requires you use your hands and feet. It’s a short drop, but to be safe, don’t be afraid to crawl. 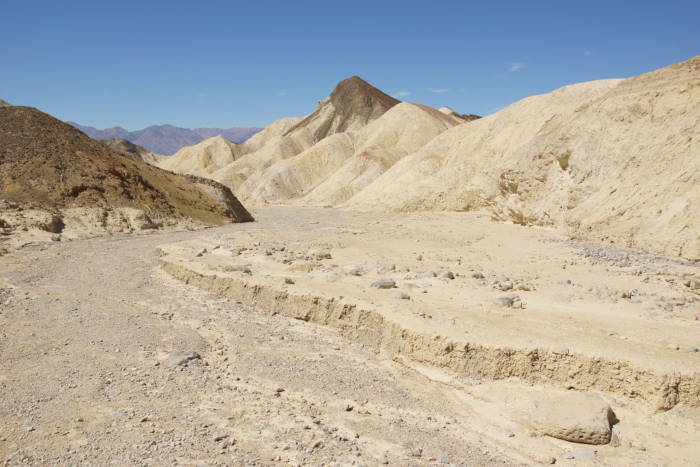 Gower Gulch comes to an end with dramatic fashion. There’s a dry waterfall that opens up into the valley. The trail hugs the hillside as it curves around and drops down. This part is narrow, and the drop-off is steep, so if you’re sensitive to such things, be aware. Once you’re out of the gulch, you still have to get back to the trailhead. It’s another 8/10 of a mile from the dry waterfall back to the parking area. 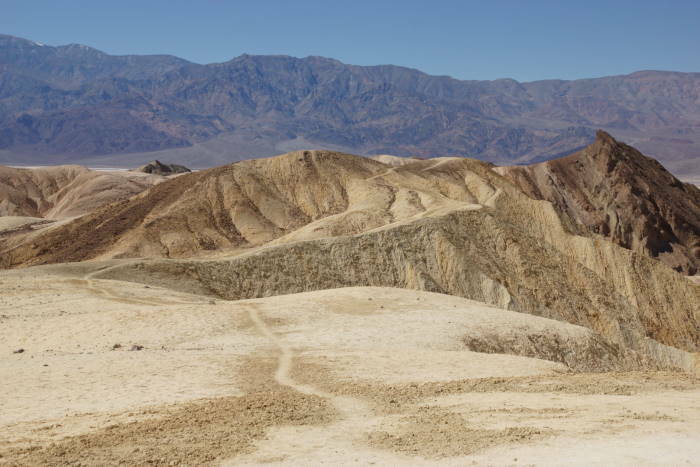 This part of the trail is relatively flat, and takes you over a few patches of Pepto-Bismol-colored dirt. It took me about 3.5 hours to hike the entire loop, including my scenic detours out the spur trails. 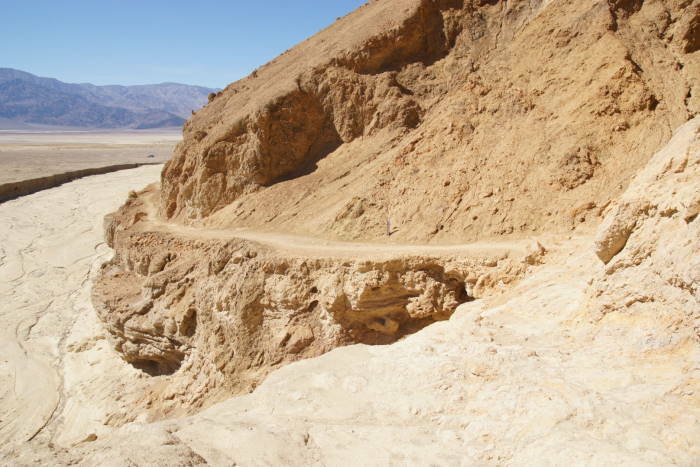 If you only have a day or two in Death Valley, the Golden Canyon/Gower Gulch Loop is a great way to spend it. If you have less time, but still want to do a hike, the trail up Golden Canyon to Red Cathedral is a nice, shorter option (which you could extend to Manly Beacon). Either way, you’ll enjoy this trail.